For over 40 years, Royal Overhead Door’s Industrial Division has specialized in assisting our customers with design, making sure the products we installed are the right products, built to take the day to day punishment. We offer a wide range of sizes, metal gauges, weatherproofing, configurations and operator systems. Every industrial job is different – different size, different specifications and different code requirements. Our Project Managers, our technical support staff and trained team of installers are dedicated to providing our customers with the best solution for any application. With an industrial product offering broad enough to meet all customers specification needs, Royal Overhead Door’s specialty doors are ideal for any size opening and all applications. 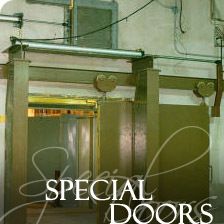 In addition to our full line of commercial sectional and rolling steel doors that will meet the needs for many specifications, our line of industrial specialty doors places Royal Overhead Door on a different level of partnership with our customers. 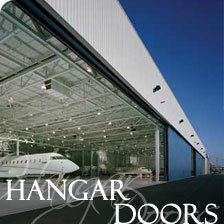 Royal Overhead Door installs a full line of Hangar Doors, Vertical Lift Doors, Four Fold Doors, Impact Doors and High Speed Doors to meet any specification. Royal Overhead Door offers a superior solution to your dock equipment needs, we offer multiple brands and we install what we sell…bringing real value to your job. We are a true full service industrial distributor.